Eaton's wide variety of products, parts, and applications make it possible to undertake just about any electrical project large or small, and we at CBW have an extensive inventory to support your needs and help you get the job done. Whether you’re building a brand new configuration from scratch or retrofitting a system requiring old Eaton and Cutler-Hammer circuit breakers, we have the parts you need. And if we don’t, we will help you find them. Our skilled and experienced technicians can match you to the exact Eaton and Cutler-Hammer part you need, taking out all the guesswork around compatibility, production status, and breaker quality and functionality. In short, we take care to provide the right tools for the job so you can focus on completing the task at hand on time and on budget. Cutler-Hammer breakers provide premium protection for countless electrical systems from damage due to overloading and surges for decades. Due in part to the age of this company, however, many components and breakers have fallen out of production – this can leave contractors in a bind for parts. Particularly for Cutler-Hammer breakers, it's not uncommon to encounter obsolete and out-of-production breakers. We understand that it can be frustrating to be unable to source a component you need to get a job done, which is why we at CBW offer the largest selection of obsolete Cutler-Hammer breakers possible. 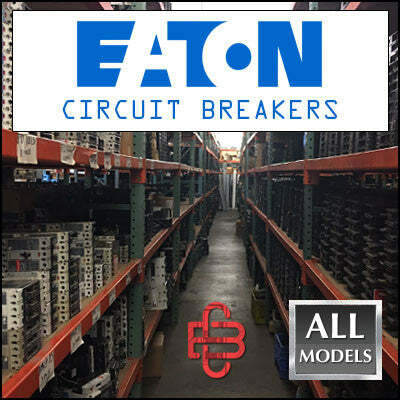 Aside from new breakers, CBW also offers reconditioned Eaton and Cutler-Hammer circuit breakers, which we ship with the same exact guarantees and warranties as our brand new items. We stand by each and every refurbished breaker, and certify that all reconditioned products have been subjected to thorough disassembly, cleaning, upgrading, and testing before sale. Our obsolete and hard-to-find Eaton and Cutler-Hammer breakers may be brand new or refurbished. New but obsolete parts are typically sourced from surplus distributors we’ve added to our wide network of partnerships spanning the entire U.S. Thanks to this network of industry sources and connections, many of these breakers and accessories are available at a fraction of their list price. It’s our commitment to ensure that your entire systems work in harmony, from the breakers to the panels, accessories and beyond. When you work with CBW, you’ll receive the same personalized, one-on-one attention from our expert technicians as did our very first customers back in 1987. Our company and our inventory may have grown extraordinarily since those days, but we still offer the same level of quality customer experiences as ever before. We understand that wholesale suppliers often offer good prices alongside compromising with distant and generic interactions, but that’s not the case at CBW. Our technicians are ready to help you identify exactly what you need, whether you only know the make and model number, or the surrounding hardware. You can even send us a digital picture of your setup or components needing replacement. Whatever your electrical system needs, we’re ready to help you get the job done. Whether you're buying new or used Eaton and Cutler-Hammer circuit breakers, each and every one of our breakers comes with a five-year warranty and a satisfaction guarantee. We only ever supply trusted, brand name electric system solutions, and guarantee against counterfeit. Not sure what part you need? No problem. Our highly-skilled technicians will help match you to the exact new or refurbished Eaton and Cutler-Hammer Circuit Breakers to fit your configuration and save you money. If you're looking for new or used Eaton and Cutler-Hammer Circuit Breakers, we'd love to hear from you. Our fast and friendly technicians are experts at sourcing the exact breaker you need for your project at a low cost. For distributors with a surplus of electrical system components, we're always looking to expand our inventory, especially for obsolete and hard-to-find breakers. Call us up, and we'll give you a competitive quote for your components.